The building that houses the drug store at the Sherbrooke Village Museum in Nova Scotia, Canada dates back to the 1880's with only a few restorations having to be made. At this village, you can wander through the drug store and browse at all the remedies that aided people through their sicknesses and daily lives. Drug stores were fairly simple in the 1880's, nothing like walking into one of the drug stores of today where shelves are stocked with various brands of goods. 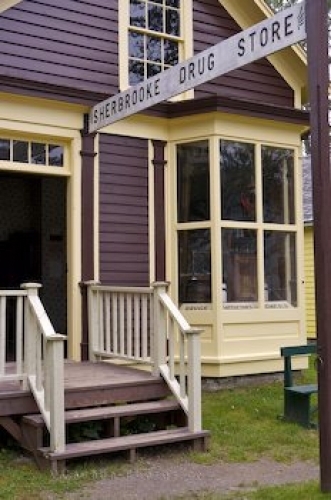 Exterior of the Sherbrooke Drug Store in Sherbrooke Village Museum (a restored 1860's lumbering and shipbuilding community) in the town of Sherbrooke along the Marine Drive, Highway 7, Nova Scotia, Canada. The Drug Store dates back to 1880. Picture of the drug store at the Sherbrooke Village Museum in Nova Scotia in Canada.